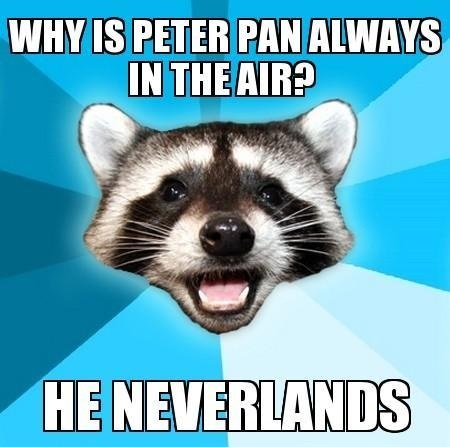 Would you believe that Peter Pan was as much a villain as Captain Hook, maybe even more so, and that he killed for fun? The lovable character known all around the world, Peter Pan killed lost boys for fun. I wonder sometimes what was going through the minds of some authors. The original book of Peter Pan, much like the original tales of The Pied Piper of Hamelin, Cinderella, Sleeping Beauty and Snow White, was at times cruel, sinister and dark. The tale of Peter Pan we have all been told is a very sanitized version much kinder to children than the version that originally existed. Of all the film adaptions that have currently been made, not one has truly shown his dark side. In the original text, Peter Pan was a very mischievous boy, and this behavior even had a dark side. In the literary world his personality would be a match for characters such as Hannibal ‘the Cannibal’ Lecter or Freddy Kruger. 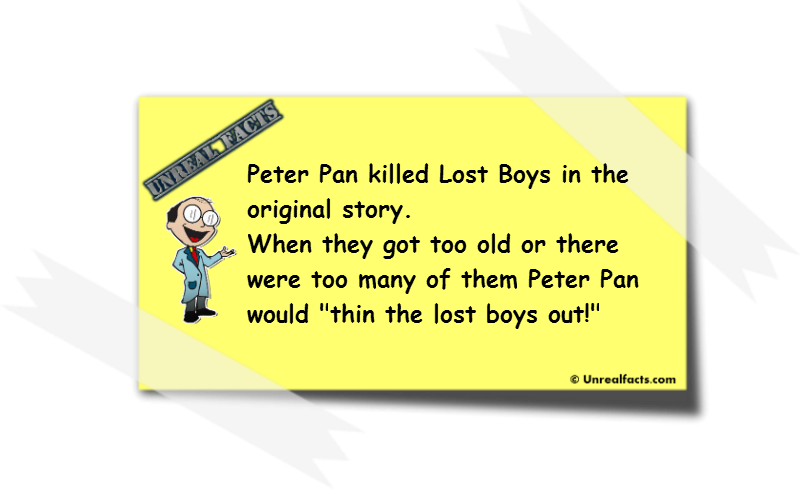 One of the sinister things that Peter Pan would do is “thin the lost boys out ” when there were too many of them or when they got too old. In other words, Peter Pan would kill lost boys, his own friends. Now that behavior could be seen by some as a way to preserve their lifestyle or maintain a sustainable living environment, but it would appear that it was more a part of his psyche rather than forward thinking for the greater good of the Neverland community. The thing is, Peter Pan killed for fun. Apart from going out on “pirate hunts“, killing pirates just for the fun of it, he would also cause havoc in the middle of battles. While the lost boys were in the middle of a battle, Peter Pan would sometimes switch sides and start killing lost boys for fun, as can be seen with the Indians. No other reason, just fun. “To die will be an awfully big adventure“. ~Peter Pan clearly showing his immaturity and disconnection with the permanency of death. Having just read how different Peter Pan was, wait until you read about Pinocchio. This is of course our own interpretation of the text. The author, J M Barrie, never explicitly reveals what “thin them out” means. It could actually mean that he sends them packing, but it doesn’t really fit in with the darker theme of Peter’s personality. No, in other words: he would make them leave Neverland. And most probably by forcing them to return to the real world. Because, why not? The same thing happened to Wendy and her brothers. And I like to know the source for the ‘switching parts’ fable. In the original there was no hook. But Barrie needed a scene so that the crew could go from Neverland to London etc.